You will be given a reference e-book to read which has 210 pages And the test will be based on that e-book , you can take the test after 10 days Of purchase. "Mastering Six Sigma Business Scorecard Certification course provides an overall insight into your business that allows the leaders responsible for the profitability and growth to look at the business in a new light." It gives these leaders a better visibility on the corporate performance of the business. The course puts a new light on the factors that contribute to the profitability of the company ignored in the traditional monitoring methodologies. "After completing this course, you will be able to build upon the proven methodologies to come up with a new method for measuring corporate performance through Business Performance Index and Six Sigma Business Scorecard. " This scorecard rises above the traditional monitoring tools as it not only monitors the performance but also tries to achieve customer’s satisfaction by offering ways to meet their expectations. Business Performance Index allows an organization to determine “six sigma level” as a relative performance measure. This course is a well-defined book in 270 pages carefully split into 13 sections out of which the first four chapters define and introduce the Six Sigma Business Scorecard. The next four chapters give you a detailed description of how to implement this Scorecard in your business. The following four chapters from Chapter 9 -12 focus on how to use this scorecard to monitor the performance. The final chapter integrates the ISO 9001:2000 and Six Sigma methodology where the scorecard is used to establish measures of effectiveness and Six Sigma used as a methodology for continual improvement. "Overview of Six Sigma and leadership for performance are also included to maximize the benefits from the business scorecard. This well-defined course is structured in a way to make it more interesting to the learners at the same time as it adds value to their resume. " This course is intended for anyone who is responsible for contributing to the profitability of the business. The course is mainly beneficial to leaders, managers, supervisors or anyone playing a role in providing for achieving profits for the company. "If you are expecting a promotion to a managerial role or if you are already in such a role but expecting to climb up the ladder of the organizational chart, this course could be your magic wand to achieve your goal." If you want your organization to achieve six sigma levels, the quickest and efficient way to achieve is for your managers to attend this course. This course will make your leaders view the business in a new perspective, and they will be able to identify the hidden opportunities and utilize those to achieve optimal growth and success in business.In case you think Six Sigma is only for large-sized organizations, you couldn't be more wrong. It can do wonders for any enterprise. Six sigma small and mid-sized organizations certification is for helping the leaders of these organizations to take their growth to higher levels and multiply profits. In the era of globalization, for any business to survive it is important that it makes use of all the opportunities through teamwork, corporate strategy, and leadership. It is also essential to monitor and assess the business performance compared to the corporate sector. This online six sigma course will introduce the BPI (Business Performance Index) which is an indicator of your business wellness in the corporate area. These two indicators, the Business Scorecard and Business Performance Index together give a better indication of the financial performance of your business. This course will teach you how to monitor your business to improve your business in areas ignored earlier and how your business can be transformed to achieve maximum success. This six sigma course will let you achieve the professional competency that is essentially needed in this highly competitive business world to achieve success. It helps you achieve faster results through better changes in the organization. "After completing this course, you can expect to get hired in a managerial role in the business area of your expertise with a much better salary. Those already working in a leadership role will be able to perform better as a manager and can expect to get promoted to a higher management role." 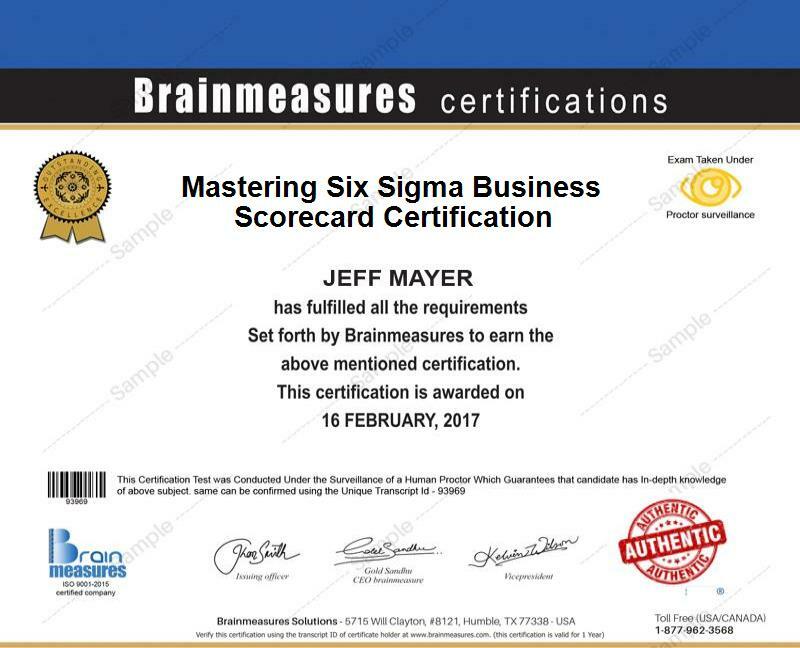 Last but not the least, Buying Brainmeasures Mastering Six Sigma Business Scorecard course can only help you to get better at what you are doing professionally. It is a clear course that you can buy for individual use or as a business owner, can buy this for your employees to get better and ultimately contribute to your business to achieve better results. The results in business growth can be easily measured if your employees also take a Six Sigma businesses improvement certification course. Even though this course is intended for those in the leadership role, this course will be useful for any working professional. Employers’ globally value Brainmeasures certifications and having this certification will be an excellent addition to your resume to enhance the career prospects. Especially true for those who are looking for a new career in a leadership role. If you are aspiring to get promoted to a manager, this course could be your ticket to get that promotion. The best companies are always looking for managers who can make a difference to their organization and those who have completed the "MASTERING SIX SIGMA BUSINESS SCORECARD CERTIFICATION" will be able to make that difference in an organization. Employers have started specifically started looking for professionals with such certification. If you want reassurance, just type in the "six sigma certification" in any of the job portals, and you will hit with hundreds of results. This course can help any working professional aspiring to get better at work and to serve in a leadership role in the future. In this competitive world, unless you make an effort to sharpen your skills to serve your organization better, you will be left behind to those who are racing to achieve the top position. Those of you who are serving in the top positions of an organization can see a remarkable difference in the profit results of your organization as you would be managing the organization in a completely new light.